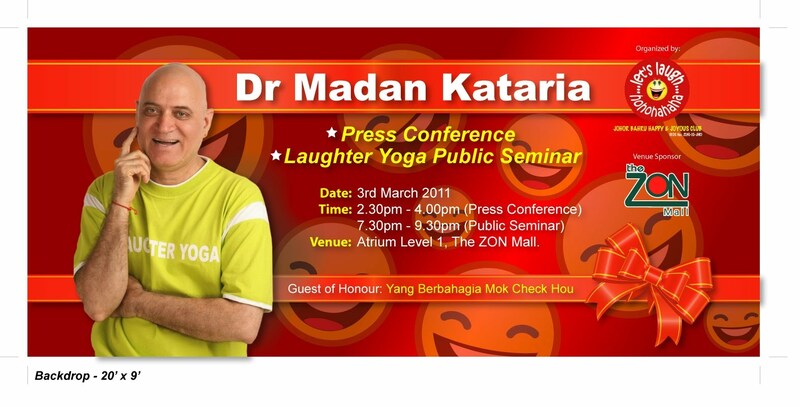 Residents of Taman Setia Indah meet every Saturday, 7.30am to laugh for 30 minutes with laughter & breathing exercises. The laughter yoga leader in this group is Siew Mei. Dr Madan Kataria, the Founder of Laughter Clubs movement and members from the Johor Bahru Happy & Joyous Club visited the Johor Police Headquarters. More than 50 police personnel turned up in the late morning for an hour of laughter led by the Laughter Guru. Dr Kataria said, "We can laugh for no reason, no jokes, no humour. Laughter is generated through exercises in a group coupled with childlike behavior and eye contact". He added that benefits of laughter include reducing stress, creates emotional well-being, promotes peak performance, enhances creativity and build team spirit.